Cherrapeno: Chocolate Gingerbread for SHF! Is it time for Sugar High Friday already? This month the theme is spices, and I'm pleased because it means I can make Nigella's Chocolate Gingerbread. Even though I have the book Feast, I first saw the recipe in the April 2008 edition of Delicious magazine. Then I spotted Andrew's post, and finally, I now have a good excuse. I cut the recipe in half and it still made enough to fill a 9" square cake tin. The cake is delicious, but very soft and crumbly, more like a brownie - not your usual gingerbread cake texture. I made a dark chocolate ganache icing because I didn't have any ginger ale on hand, but have put it on the shopping list for next time. To enter your own spicy, sugary treat, go to this month's SHF host - the fabulous Dessert First - for all the details. Sugar High Friday was created by Jennifer at The Domestic Goddess. You can see all the previous themes here. Nic your photos are fantastic - they make me WANT to eat cake and I don't even like cake! Oooh! That looks fabulous! With all that gooey ganache, I want to dive right in! Nic kudos to you, that photo is just stunning!! I have baked this gingerbread before and can vouch it really is gorgeous just how your photo shows! Love the close up, it has me reconsidering what I had planned to make today. Thank you so much for the tip about recipezaar table setting forum. I am looking into it as I write. I only did 'Diner en Blanc', but there are so many wonderful ideas that all the ladies and a few gentlemen(55 tables in all) did, I wanted to share what I felt were the most interesting and helpful. Thank you again. one..i love gingerbread. two, that drippy ganache frosting is just drivin me nuts! i'm ready to pull my hair out just looking at it. Oh my, my mouth is watering! oh, i just posted on my blog a bit ago about how much i love gingerbread recipes! this one looks absolutely delicious-that ganache looks heavenly! It's a good job this cake is nowhere near me, I would eat it ALL! Oh my - that really does look wonderful! So indulgent. I love gingerbread and obviously love chocolate - I imagine the combination must be superb. Ooooooooooh heavenly... I even tried to catch some chocolate dripping off! Totally yummy Nic!! Ooooh, everything on your blog looks sooooo delicious! I'm off to the kitchen to make a paninni! OMG what a nice treat. I m droooling I m licking the monitor :) this is delicious. 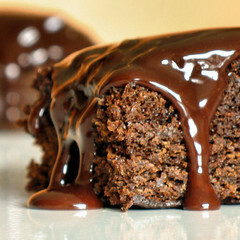 Your little camera turns out some mighty fine pictures :) The drizzle of chocolate is almost hypnotic! I made a pear and ginger upside pudding for SHF but I haven't had the time to post it. Thanks for the reminder. Nic- Chocolate Gingerbread, I haven't had that in ages! Your looks fantastic. Love the ganache on that cake too! What a wonderful idea, Nic! And the icing complements it beautifully. This looks absolutely perfect - I have such a craving for it now! So gooey... phwoarr..
Oh wow! 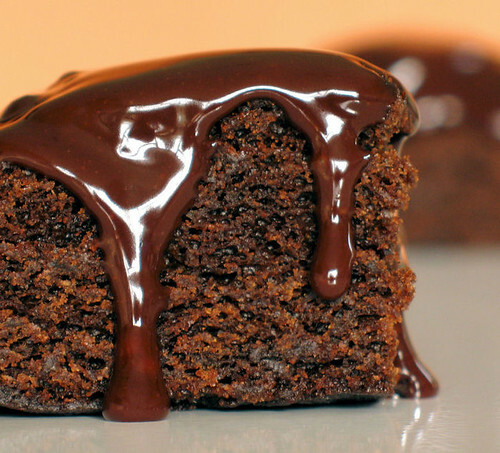 This cake is so gooey and moist looking. Yum! I am licking my computer screen! That drippy chocolate pic is going to drive me nuts! I'll be thinking about it all day, I'm sure. Looks fabulous Nic! Haha, you are not fan of radishes? What a wonderful photo. The look like I could just slurp up the icing. There you go AGAIN with some "oozing" goo sweet stuff! Irresistible! Completely! Oh, how love ooze, love IT! these sound really good and look totally droolworthy! wow look at that saucy chocolate! Chocolate and ginger is one of my favourite combos! yummy! thank you for your kind comment! yep, my macarons tasted good... it's a good thing the tongue judges by taste and not looks! 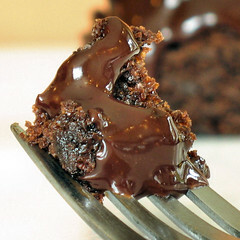 the icing on your gingebread cake looks so good, there is no way to go wrong wtih dripping chocolate! Oh my that looks so good. As if I haven't had enough chocolate lately already. THANK YOU ALL!!! I really appreciate you taking the time to leave a comment - especially when they are so lovely!! Amber - you're welcome, hope you find that forum useful! Katie - lol, what's the point of them? Ha ha! Oh Nic, that first picture is illegal! It almost killed me craving for your wonderful cake. Seriously, it looks soo delicious! Hope I get the chance to try it soon. oh ican smell it from here! Wow Nic this Chocolate Gingerbread looks fabulous and delish. I have always wanted to make this but never got round to! I think I have to make this very soon. ooh boy!! I am literally salivating here Nic! that looks absolutely Gorgeous!! Oh my...chocolate gingerbread sounds fabulous. Great pictures. Is that the world's most perfect ganache or what? Looks sublime. Jammin' with British Scones and Clotted Cream!